Scientific innovation and discovery touches all aspects of American life, from medical care to the food we eat and the technologies we rely on in our daily activities. A report released Thursday by the Pew Research Center allows us to compare views on a range of specific topics between the American public and U.S. scientists connected with the American Association for the Advancement of Science (AAAS). The study marks the center’s new initiative to study the intersection of public opinion, science and all aspects of society. 1There are large differences between the public and scientists on a wide range of science-related topics, but the largest one is genetically modified foods. Pew Research asked both a representative sample of the public and AAAS scientists about a range of science-related topics, from climate change to childhood vaccinations. More than any other issue, the public and scientists had very different views about the safety of eating genetically modified (GM) foods. 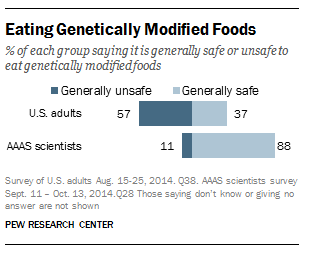 A majority of the general public (57%) says that GM foods are generally unsafe to eat, while 37% say such foods are safe; by contrast, 88% of AAAS scientists say GM foods are generally safe. One possible reason for the gap: Two-thirds of the public (67%) say scientists do not have a clear understanding about the health effects of GM crops. We also saw sizable differences between the two groups in their views about the use of animals in research; whether vaccines for childhood diseases such as measles, mumps and rubella should be required; and which energy technologies to use. The only one of the 13 issues compared where differences between the public and scientists are particularly modest is the International Space Station. Fully 64% of the public and 68% of AAAS scientists say that the space station has been a good investment for the country. 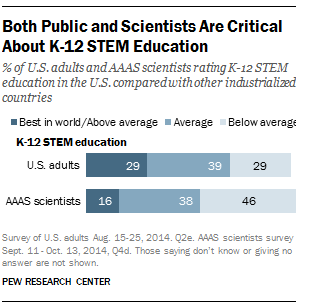 2Both the public and scientists see the U.S. behind other nations on K-12 STEM education. While both scientists and the public tend to see U.S. scientific achievements as high among other industrial countries, both groups are markedly more critical of the quality of American science, technology, engineering and math (STEM) education in grades K-12. Only 16% of AAAS scientists and 29% of the general public rank U.S. STEM education for grades K-12 as above average or the best in the world. Fully 46% of scientists and 29% of the public rank K-12 STEM as below average. A majority of scientists see a connection between the country’s education system and its understanding of science. Three-quarters of scientists (75%) view too little STEM education for grades K-12 to be a major factor in the public’s limited knowledge about science. 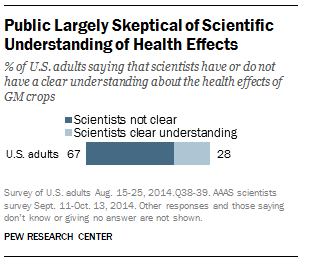 An overwhelming majority of scientists see the public’s limited knowledge about these topics as a problem. 3Fewer scientists see good times today. Scientists’ overall assessments of the sciences, while still mostly positive, are less upbeat than they were in 2009, the last time that Pew Research conducted a survey of AAAS members. About half of AAAS scientists (52%) say this is generally a good time for science as a whole, down 24 percentage points from 76% in 2009. Similarly, the share of scientists who say this is generally a good time for their scientific specialty is down from 73% in 2009 to 62% today. The drop in positive assessments of the state of science since 2009 occurred among scientists of all disciplines, those with a basic and applied research focus, as well as those working in academia and those working in industry. 4Americans’ views about U.S. scientific achievements are still largely positive, but a little less rosy today. A 54% majority of adults consider U.S. scientific achievements to be either the best in the world (15%) or above average (39%) compared with other industrial countries. Of the seven aspects of American society rated, only one was seen more favorably: the U.S. military. Compared with 2009, however, the share saying that U.S. scientific achievements are the best in the world or above average is down 11 points, from 65% in 2009 to 54% today. More now see U.S. scientific achievements as “average” in the global context (up from 26% in 2009 to 34% today) or “below average” (up slightly from 5% in 2009 to 9% today). 5Views about science topics only sometimes divide along political lines. While there has been increased political debate in recent years about some science topics, especially climate and environmental issues, not all public views about science, or even about climate and environmental topics, are divided along political lines. 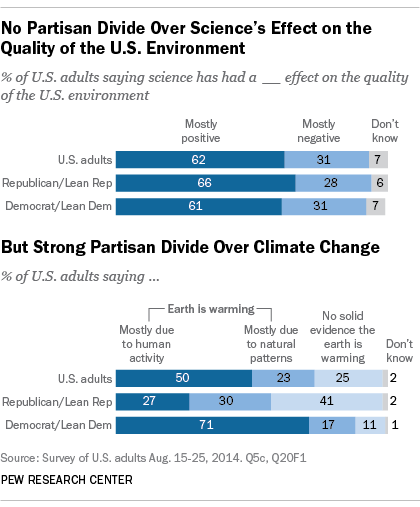 For example, two-thirds (66%) of Republicans (including independents who lean Republican) say the effect of science on the quality of the environment in the U.S. has been mostly positive, as do 61% of Democrats and independents who lean Democratic. But there are stark differences between political groups when it comes to whether climate change is occurring and the primary factors driving climate change. Asked to choose which of three alternatives describes their views about the earth’s temperature, 71% of Democrats and independents who lean Democratic say the earth is warming primarily due to human activity, such as burning fossil fuels. By contrast, just 27% of Republicans and leaning Republicans hold this view; 30% of this group says climate change is mostly due to natural patterns in the earth’s environment and 41% say there is no solid evidence the earth is warming. The Pew Research Center survey also asked half the sample of adults about climate change using an alternative, two-question approach. Survey respondents were first asked whether there is evidence the earth is warming, and second for their reasons behind that viewpoint. Here, too, there are large differences between political groups. Fully 87% of Democrats and independents who lean Democratic say there is solid evidence the earth is warming, while just 10% say there is no solid evidence of this. By contrast, 53% of Republicans and independents who lean Republican say the earth is warming and 43% say there is no solid evidence of warming over the past few decades.